At D&G, our philosophy of operation is based on a commitment to continuous quality improvement, and excellence from all company personnel through active participation and involvement. The continuous quality improvement program empowers all employees to contribute to ongoing improvement. Statistical measurement, employee involvement teams and formal corrective action provide a solid foundation for quality improvement. 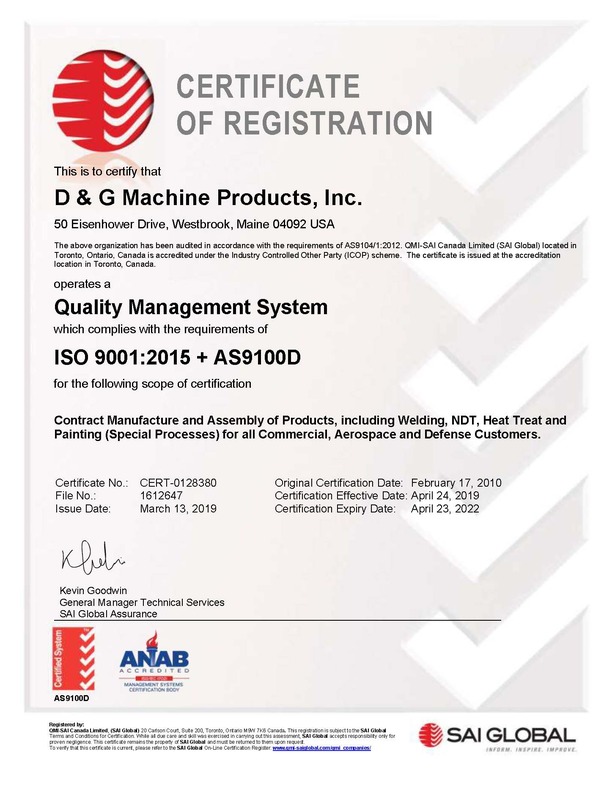 D&G, an AS9100, ISO-9001 registered company, is committed, via formal corporate policy, to manufacturing products of the highest quality level achievable, consistent with the requirements specified by both the customer and the applicable codes and standards of construction. We execute this policy by implementing a rigorous quality program that is described in our ISO-9001 procedures. These procedures are working documents that define the methods and assure that all activities affecting quality are addressed and documented, as required. ASME sections I and VIII, and ANSI B31.1.